I started into Lego around the age of 6-7 years old. 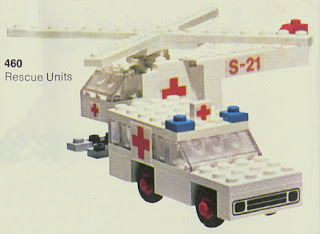 I remember having something similar to #460 (Rescue Units), maybe the #455 (Learjet), and some generic universal building set from the 70’s. And that was it — Lego was expensive and my parents couldn’t afford much more. I had acquired a Mike Sells potato chip box from my uncle and kept my Lego bricks there, along with some American Plastic Bricks, Tinker Toys, green army guys, dice, jacks, pennies… and kept other hand-me-down toys in it. The building set had this green 10×20 base brick (there were no row of tubs on the underside, so you could only connect bricks to the top of the base brick). I remember trying to build a house with it, but never seemed to have enough bricks to build it completely. I remember being frustrated with building: I never seem to have enough bricks to build what I wanted to and I never seem to have enough bricks in the same color I wanted to build in; because the stupid American Bricks would never connect to Lego (but that wasn’t Lego’s fault), I was frustrated with not having enough windows or doors; and I had lost the instructions and boxes, so I could never figure out how to rebuild the helicopter, ambulance, or jet.